lugar perfecto para unas vacaciones! rodeado de gloriosas vistas a la montaña. niños en el Scotch Creek Family Fun Center. * 3 habitaciones - 1,500 pies cuadrados - más sofá cama doble para 8 personas. Total de 4 camas queen. * Cocina gourmet completa con encimeras de granito. * Chimenea de gas con acabado pizarra. * Muebles de pino a medida, impecablemente acabados. * Incluye acceso y uso de muelle privado y estacionamiento. Son las pequeñas cosas que hacemos, ir más allá. Eso hará toda la diferencia en tus vacaciones con. *** Tenga en cuenta que se requerirá una tarjeta de crédito para la retención de depósitos de daños. 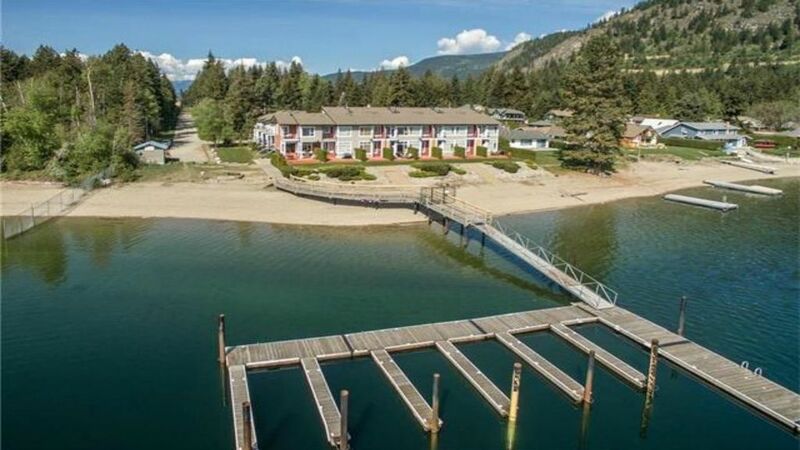 Este es el lugar más bonito Shuswap tiene para ofrecer, que cuenta con: * Huéspedes Shuswap Lake Provincial Park * 200 pies de playa privada * Muelle privado * Dos terrazas privadas * Barbacoa Gas Sólo 1 cuadra de las tiendas y restaurantes. Very nice condo with a lake view! Boat slip is very useful too. Location is beautiful and the condo is well stocked with everything you need! All the amenities of home with a beach, dock and lake! The condo was all very well stocked with everything you need in the beautiful Shuswap setting. Our group was two families with a total of 7 people and we never felt crowded or lacking in anything. Great location. Wonderful neighbors. The unit was very comfortable and quiet with all the comforts of home. We are boaters and the access to the water was great. We had a very good week in #12! The beach was right in front and we found all the dishes, spices, coffee and paper products a nice touch. Next time we won't need to pack so much. Everything was clean and tidy. This location is very quiet and combining that with the air conditioning, we slept very well. Thank you for a great holiday rental! Thank you. We are glad you enjoyed your stay. Look forward to have you visit us again. We had a great stay at this location, the unit was extremely clean, well equipped kitchen, we really enjoyed the beach and dock area as well. Beautiful views. Thank-you for your review. Looking forward to having you stay with us again! We booked this for a shuswap getaway and the location could not be better. The townhouse has everything you need (and more) with TV, internet on the rainy days, and the private dock is a perfect way to catch some fish in the evening and watch the sunset and relax. The private balcony in the master bedroom had a perfect view of the lake and waking up with that view never got old. Was pleasantly surprised with the amount of amenities in the home to make for an even better stay. We visited the pub just down the road and the people there were very friendly, as well as the winery only 15 minutes away in Celista. There is so much to do in the area and with the Shuswap Lake Provicinal Park with boat launch right beside, it has everything we needed for a perfect lake vacation. The neighbours were all very friendly as well and I can not wait to book again and go back for a week next time! tienda, licorería y restaurantes. También hay bodegas increíbles en la zona. CANCELLATION POLICY: (Please read Carefully) All deposits and balance of payments are non-refundable unless your reservation can be replaced less a 25% administration fee. We will however attempt to resell the reservation time booked if you have to cancel. If the townhouse is re-booked we will issue you a cheque for the balance less 25% administration fee. All cancellations must be in writing.